The Healthy Breakfast section serves as a catch-all for all recipes that might be beneficial to an existing dietary strategy. 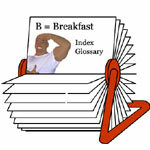 Low-carb, low-fat, dairy-free and vegitarian recipes will be found grouped together in Healthy Breakfast section. "Great Breakfasts" Start With The Letter "N"